After teased by the trailer to this movie which was shown weeks in weeks out, finally the film premiered in the Indonesian cinemas today. It so happened that I have got 2 vouchers to the 4DX cinema that I have to utilize before 28th December, so it was lucky that this movie also played in the 4DX theater in CGV Grand Indonesia. My wife and I decided to go and see the movie there to experience all the effects which I thought would be awesome. We shall proceed with the movie now. A high school student who loved to play video game named Spencer (Alex Wolff - My Friend Dahmer etc) was punished to the detention room with 3 other students, a rather shallow selfish popular girl Bethany (Madison Iseman - Still the King TV series etc), a popular football star Fridge (Ser'Darius Blain - When The Game Stands Tall etc), and a shy awkward girl named Martha (Morgan Turner). In that room, they found an old type of video game titled JUMANJI which they tried to play. Each one of them chose the character in that game which apparently made all 4 of them somehow transported into the game itself in the Jumanji world. Inside Jumanji, they all transformed into the characters they chose. 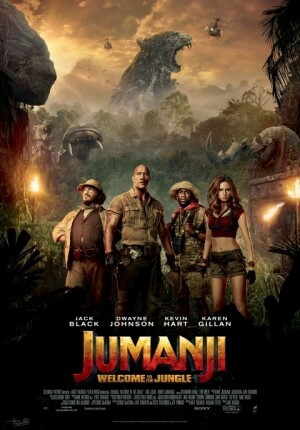 These characters were led by the archaeologist Dr. Bravestone (Dwayne Johnson - Baywatch movie, Moana etc), the cartographer professor Sheldon (Jack Black - Shallow Hal, voice of Po in Kungfu Panda etc), the zoologist Moose Finbar (Kevin Hart - Ride Along, Central Intelligence etc) and the amazing fighter & good dancer Ruby Roundhouse (Karen Gillan - The Circle and as Nebula in Marvel's Guardians of the Galaxy). All of them were very surprised to be thrown inside the game and later on realized that they had to play the game till finished to return to their world. In order to complete the game, they have to pass various stages, including avoiding the capture of the evil explorer named John Van Pelt (Bobby Cannavale - Ferdinand, Nurse Jackie TV series etc). With additional help from another character who was the pilot named Seaplane (Nick Jonas of the band Jonas Brothers), the 5 of them had to cooperate despite their differences. So could they achieve that and finally return to their homes? Find them all in this fun comedy adventure movie. Well this movie was exactly what I would hope for in term of comedic situation and provided us a good amount of laugh. In fact what my wife and I noticed was the movie was a lot more comedic than adventurous. This was a bit different from the movie's predecessor, the 1995 version of Jumanji which felt having more adventure. Apart from being a sequel to that movie, this one also served as a tribute to Robin Williams who played the lead character of Alan Parrish. There was a nice scene related to him in here (be sure to catch it). From my personal view, the original movie was something that truly blow my mind with the obviously awesome special effect at that time and also a wonderful experience seeing so many animals came and wreak havoc in the city. While in this movie, the characters were the ones who went inside the game and the animals scenes were not that frequent. As I mentioned above, this film had more comedic scenes so the adventures were adequate, but could have been more. The movie seemed to focus on the characters development and chemistry which were fun to see. I actually loved Jack Black's character whom I think was totally spot on. Kevin Hart and Dwayne Johnson seemed to hit it off very easily, most likely because they had played in an action comedy movie earlier Central Intelligence. Meanwhile Karen Gillan was totally different from the other roles that I had seen earlier as she provided few funny moments, with the funniest one relating to 2 bad guards. What I loved the most was the high school students were transformed into totally different adult persons and had to adjust themselves with their transformation. Though this also provided some rather crude jokes which probably not understood by young children. There were 2 scenes that were cut by Indonesian censorship body which I personally felt a bit too much as the movie was not categorized for all ages. The special effects were definitely a lot better than the 1995 version (especially if you see the old one now). And watching this in a 4DX studio really brought the best experience as well, since we got to feel and enjoy the motions of jumping, climbing and falling, with smoke and wind effects and many more. The only flaw in this cinema was unfortunately the sound system was not great. Luckily those motion effects truly made up for it. During the almost 2 hours duration of the movie, my wife and I had plenty of laughs and for me personally, I was happy and satisfied watching this one as it provided me with the light pop corn movie where I do not have to overthink and just enjoy it. Btw, there was no end credit scene in the movie which was rather surprising as I thought (and hoped) there would be one. Anyway, if you are looking for a fun, light, comedy adventure movie, then you definitely should see this one. If you have seen the original movie, you might also enjoy this as it had the aura and some scenes that would remind you with that one. If only Robin Williams still around, perhaps he would be making a cameo appearance here. It would be best if you have seen the original movie first before seeing this one to really appreciate and understand it better. And please do not expect a heavy logical movie where you need to over analyze it. Just go to the cinema and experience the fun.